In nature, it is theorized that, on average, the proverbial tip of an iceberg visible to observers represents no more than twenty percent of the floe’s total volume. The same statistic could be used to accurately describe the ratio of familiar music in the Classical repertory to the overwhelming wealth of compositions that remain largely unknown. Even now, when new technologies enable Twenty-First-Century listeners to explore musical backroads and byways that previous incarnations of recording technology could not travel, there are for every Bach, Beethoven, and Brahms innumerable companies of composers living and dead whose music is substantially or wholly ignored. In truth, a well-meaning inclination to proclaim every piece recovered from neglect a rediscovered masterpiece is no more beneficial than dismissing unheard music as deserving its obscurity, but one of the inscrutable marvels of art is the rare but potent ability of artists to perform a work or a whole repertory in a way that not only figuratively clears the cobwebs but also literally redefines the ways in which the music is interpreted, performed, presented, and received. This is what Maria Callas and Magda Olivero achieved in bel canto and verismo repertories, what Marie-Claire Alain did for her brother Jehan’s music for organ, and what Arthur Grumiaux did for Händel’s forgotten violin sonatas. 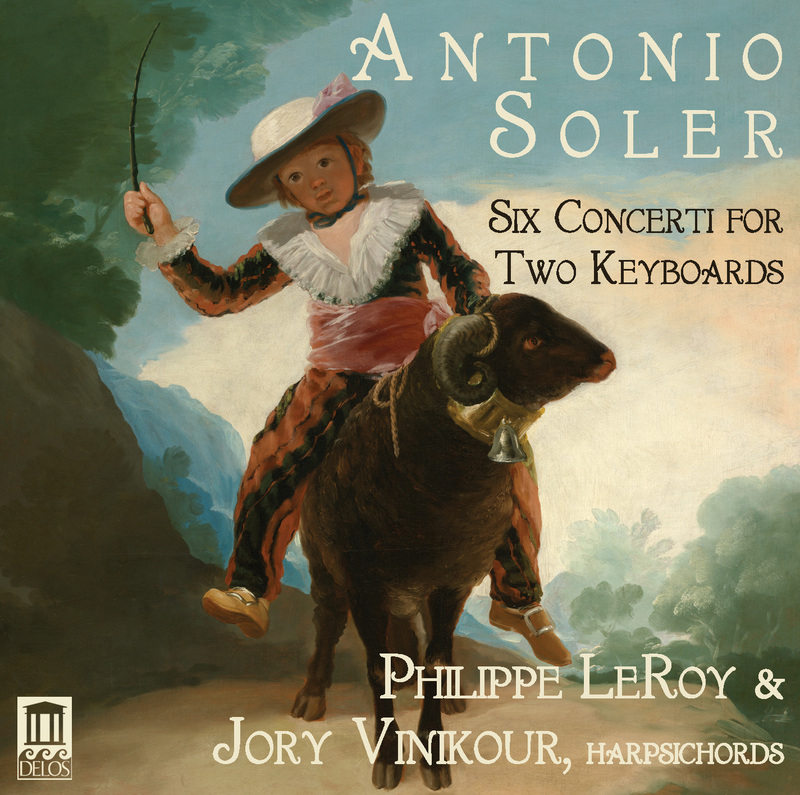 This, too, is what internationally-acclaimed harpsichordists Philippe LeRoy and Jory Vinikour accomplish with this new Delos recording of the Six Concerti for Two Keyboards of Antoni Soler i Ramos. This music is not unknown, but hearing this disc, in the context of which producer and recording engineer David Bowles centers the music in an acoustical space of stunning, almost clinical clarity, may prompt the listener to believe that this is his first contact with these Concerti. A performance of music for harpsichord is expected to dazzle with virtuosity, and there is no shortage of nimbly-executed deluges of notes here, but the stylistic acuity and aesthetic sophistication are the attributes that mark this as a pioneering disc. The notes are but the tip of this musical iceberg: as played by LeRoy and Vinikour, the true merit of this music shimmers beneath the surface. The uncertainty that undermines complete understanding of these Concerti’s provenance is as frustrating as an instance in which so much is known or can with relative credibility be conjectured can be. The Concerti were not published until the sixth and seventh decades of the Twentieth Century, and the dedication inscribed on Soler’s manuscript—para la diversion del Ssmo. Infante de España Dn. Gabriel de Bourbón—only confirms the composer’s association with the Spanish royal family documented by history. Known events and intersections in the lives of Soler and the Concerti’s dedicatee Gabriel de Borbón (1752 – 1788), the tenth of King Carlos III’s thirteen children, date the composition of the Concerti to circa 1770, when the precocious Infante remained under Soler’s tutelage, and only the demands of the music exceeding the capabilities of the instruments known to have been in the Borbón collection during the second half of the Eighteenth Century advocates for the Concerti having been intended for harpsichords rather than organs, on which they have often been performed and recorded since their publication. Whether, like Bach’s famed Notenbüchlein for his wife Anna Magdalena, the Concerti were conceived primarily for the edification and entertainment of Soler’s patron as their dedication suggests or for public exhibition of the adolescent prince’s talent remains—and is likely to continue to remain—undetermined. What is apparent from the first bars of the Andante movement of Concerto No. 1 in C major is that Soler’s music might have been composed to showcase the assets of LeRoy’s and Vinikour’s unique artistic partnership. The harpsichordists’ individual styles are very different, the Frenchman LeRoy approaching his music with understated intensity and the Chicago-born Vinikour employing a more outwardly flamboyant but no less introspective manner. LeRoy plays in Rabelaisian poetry and Vinikour in Hawthornean prose, but the musical narratives that they fashion are uncannily compatible. Both the graceful Andante and the effervescent Minué draw from LeRoy and Vinikour playing in which refinement and technical flair are ideally merged. The imagination that both gentlemen display in handling the variations in each of the Concerti’s Minué movements is one of the disc’s greatest virtues, the novelty of their phrasing consistently enticing the listener to eagerly await the music’s next unexpected subtlety. The slyly sentimental Concerto No. 2 in A minor opens with a dulcet Andante that gains from LeRoy’s and Vinikour’s sensitive touch the lilt of a troubadour’s canso. The sparks struck by the harpsichordists’ exchanges in the subsequent Allegro movement ignite a rhythmic bonfire that elucidates the inventiveness of Soler’s part writing. The Tempo de Minué is executed with such precise synchronicity that it seems impossible that human fingers are responsible for the performance, but what is heard here is mastery, not mechanism. LeRoy and Vinikour allow none of the slower-paced movements among the Concerti to drag or lose momentum, and their performance of the Andantino in Concerto No. 3 in G major embodies the strategy that sustains the high level of their endeavors in all of the Concerti. Imposing nothing upon the music, they ask questions of no one other than Soler and themselves, and the answers that they incorporate into their playing are all the more persuasive for not being ostentatiously purported to be definitive. Here, too, the musicians’ performance of the Minué is characterized by tightly-sprung but unforced rhythmic accuracy. The emotional profile of the Affettuoso - Andante non largo movement with which Concerto No. 4 in F major begins is powerfully projected by LeRoy’s and Vinikour’s unaffected phrasing, Soler’s melodic lines allowed to breathe and nuanced harmonies given space in which to cast their spells without either aspect being unduly emphasized. Again, their playing of the Minué is lovingly ebullient. The Cantabile that launches Concerto No. 5 in A major, the most conventionally expressive of the Concerti, is music of palpable sincerity that would not sound out of place in Haydn’s and the young Mozart’s keyboard sonatas. The pensive camaraderie between LeRoy and Vinikour yields its richest effects in this music, their hypnotic interweaving of melodic strands extracting every joule of timbral warmth from John Phillips’s gelid-toned Florentine-inspired harpsichords. Even the fifth Concerto’s Minué looks inward more noticeably than any of its brethren, and these musicians follow where it leads, lending every ornament a distinct purpose within the movement’s broader landscape. The fascinating structure of Concerto No. 6 in D major develops from its inaugural Allegro - Andante - Allegro - Andante movement, the alternating moods of which are put to striking dramatic use by LeRoy and Vinikour. The unfettered joy of their tandem guidance of thematic development in the Concerto’s Minué produces seven-and-a-half of the most pleasurable minutes on the disc. It seems wholly logical that, on some level, music is inherently Existential. As John Donne might have opined, neither any musician nor any piece of music is an island upon the shores of which no external influences intrude. Examined from any conceivable perspective, music is defined by collaborations, by the bonds that form and evolve among music, performers, and audiences. In essence, this disc is two uninhibitedly communicative artists’ earnestly personal solution for one of music’s great, Sartre-esque enigmas. In this music and in their awe-inspiring arsenals of musical skills, Philippe LeRoy and Jory Vinikour are equals. Could he hear this recording of his Six Concerti for Two Keyboards, Padre Soler would surely also welcome them as equals with the pious altruism for which his contemporaries praised him. Author’s Note: In addition to reviewing this recording of Soler’s Six Concerti for Two Keyboards, I had the great privilege of writing the liner notes for this release. I was in no way involved with the planning, preparation, making, or marketing of the disc, however, and therefore assess it without bias. It was said by the first Chancellor of unified Germany Otto von Bismarck—and repeated but not, as has sometimes been suggested, originated by Tim Rice and Andrew Lloyd Webber in Evita—that ‘politics is the art of the possible.’ In this era of imperiled public funding for the Performing Arts, aging audiences, and short attention spans, what, then, is opera? Just as it was when the genre-initiating scores of Jacopo Peri and Claudio Monteverdi were first performed in the late Sixteenth and Early Seventeenth Centuries, opera is the art of the beyond possible—neither the impossible nor Ivor Novello’s ‘land of Might-Have-Been,’ that is, but what can be. Harnessing the power of what opera can be and what opera can mean to a community is central to the mission of Berkshire Opera Festival, an initiative that aims to build upon the momentum established by Berkshire Theatre Group since its inception in 2010 by bringing world-class but accessible and affordable opera to the Berkshire region of Western Massachusetts. 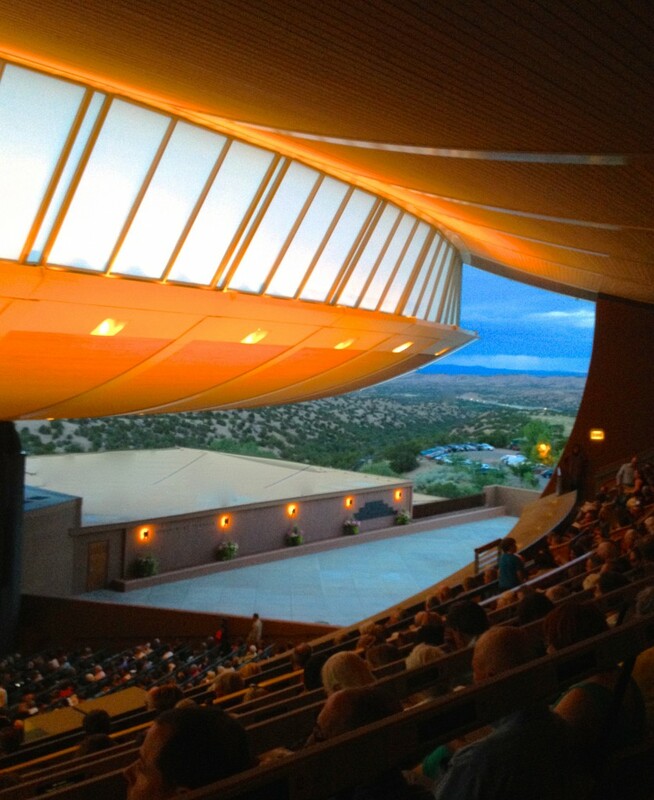 With programming including recitals and an Opera Talk presented by eminent connoisseuse and industry insider Cori Ellison, the 2016 Festival culminates in late August and September with BOF’s inaugural mainstage opera production, a staging of Giacomo Puccini’s Madama Butterfly conducted and directed by BOF Artistic and General Directors and Co-Founders Brian Garman and Jonathon Loy. In advance of the performances of Madama Butterfly, BOF’s objectives will be furthered by a pair of intriguing recitals, both of which will introduce singers from the Madama Butterfly cast, as well as special guests. On Wednesday, 10 August, the Festival will present Breaking Down Barriers: Songs by Female Composers of Puccini’s Time in Ventfort Hall Mansion in Lenox. Featuring passionate performances of Art Song repertory composed by unjustly-neglected veriste of Puccini’s generation, this performance will confirm that the creation of red-blooded Italian melodies is not solely a gentleman’s undertaking. A week later, on Tuesday, 16 August, Puccini’s own under-explored Art Songs seize the spotlight in The “Unknown Puccini”: A Recital of Songs by Puccini, performed at First Congregational Church in Stockbridge. With General Admission tickets priced at only $30, these budget-friendly recitals offer Manhattan-quality musical adventures that do not demand that attendees be Wall Street trust-fund babies. Tickets for both recitals can be purchased online or by phoning 413.213.6622. Imaginatively brought to life by a team of talented, experienced artists including scenic designer Stephen K. Dobay and costume designer Charles Caine, BOF’s production of Madama Butterfly brings an ensemble worthy of Milan’s Teatro alla Scala, where the opera had its bafflingly unsuccessful première in 1904, to the stage of Pittsfield’s beautiful and historic Colonial Theatre. The Cio-Cio San of celebrated Moldovan soprano Inna Los will fall victim to the charisma of the Benjamin Franklin Pinkerton of tenor Jason Slayden, and the couple’s drama will play out under the benevolent watch of the Sharpless of baritone Weston Hurt. Mezzo-soprano Sarah Larsen will portray Cio-Cio San’s devoted maid Suzuki, and the meddlesome marriage broker Goro will benefit from the electric stage presence of tenor Eduardo Valdes, a Metropolitan Opera stalwart with nearly 600 MET performances to his credit. Bass-baritone John Cheek will pronounce Lo zio Bonzo’s thunderous denunciation of his delicate niece, and baritone Benjamin C. Taylor will woo her as the wily Yamadori. Mezzo-soprano Katherine Maysek will depict Pinkerton’s ‘vera sposa americana’ Kate, and to Pittsfield native baritone John Demler Il commissario imperiale’s utterances will be entrusted. Performances are scheduled for 27 and 30 August and 2 September, and tickets range in price from $20 to $98. 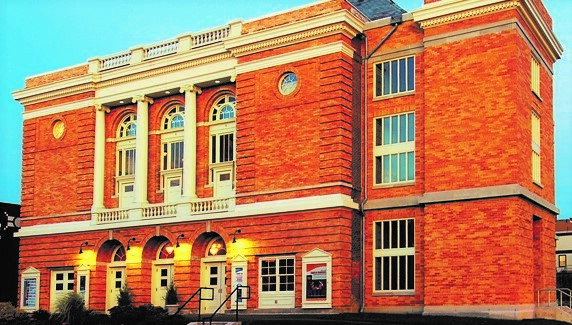 An evening of top-quality, heartbreaking Italian opera in Pittsfield can be savored for the cost of dinner at the neighborhood trattoria! Tickets for Madama Butterfly can be purchased online or by phoning 413.997.4444. One of the greatest challenges facing opera companies, particularly American opera companies, is the necessity of attracting new audiences to ensure the genre’s continued success without alienating the aficionados whose dedication has carried opera through the dark days of economic recessions and waning governmental support. With the myriad of instant-gratification distractions of today’s digital-media environment, a critical component of recruiting the next generation of opera lovers is overcoming the lingering stigma of opera’s perceived elitism. Talk is cheap, but, without compromising the integrity of performances and productions, opera can be, too. Committed to bringing opera that is ‘of the people, for the people, and by the people’ in the best Lincolnsian sense to Western Massachusetts, Berkshire Opera Festival is a paramount model of opera as the art of what can be. What a time this is for those listeners who love the operas of Wolfgang Amadeus Mozart! On the heels of a rollicking account of Die Entführung aus dem Serail from Le Cercle de l’Harmonie and Jérémie Rhorer and with traversals of La clemenza di Tito from cpo, Zaide from Signum Classics, and Don Giovanni from Sony Classical on the horizon comes Deutsche Grammophon’s thought-provoking new recording of Le nozze di Figaro, the fourth installment in conductor Yannick Nézet-Séguin’s and tenor Rolando Villazón’s venture to record Mozart’s seven mature operas, spanning the decade from 1781’s Idomeneo, re di Creta to 1791’s Die Zauberflöte and La clemenza di Tito. Recorded during two concert performances and a rehearsal in July 2015 and expertly engineered by Tonmeister Rainer Maillard and Assistant Engineer Douglas Ward to both uphold Deutsche Grammophon’s legendary standards of sonic excellence and preserve enjoyable aspects of the live-performance atmosphere, most notably the audience’s blissful laughter, this account of Le nozze di Figaro unites Mozartean veterans with newcomers in a musical setting that fuses elements of period-appropriate practices with the extraordinary legacy of the opera’s 229-year history. This emphatically is not a dainty, tempest-in-a-teacup performance, however: Mozart’s, librettist Lorenzo da Ponte’s, and playwright Pierre-Augustin Caron de Beaumarchais’s drama surges from these discs, every sigh, smile, and stress vividly, lovingly brought to life. Written in 1778, Beaumarchais’s comedy La Folle Journée, ou Le Mariage de Figaro was the central work in a triptych that sent shock waves of seismic intensity through late-Eighteenth-Century intellectual circles, its convoluted sagas of wily servants sparring with despotic aristocrats garnering disapproval in seats of power throughout Europe. Though banned throughout Hapsburg lands by imperial decree owing not to its barbed social satire but to its copious sexual innuendo, Lorenzo da Ponte miraculously procured authorization from Joseph II’s court to adapt La Folle Journée, ou Le Mariage de Figaro for the operatic stage. The resulting libretto, the first of three of the poet’s texts that Mozart would eventually set, is a marvel of humor and humanity—precisely the sort of material that appealed strongly to Mozart’s cosmopolitan sensibilities. Recently named James Levine’s successor as Music Director of The Metropolitan Opera, making him only the third holder of that title after Levine and Rafael Kubelík, the Québécois Nézet-Séguin, barely out of his thirties, confirms with his stewardship of this recording of Le nozze di Figaro that he is both a Mozartean of once-in-a-generation significance and a fully-qualified heir to Levine and Kubelík—and, looking further back into the annals of MET history, Gustav Mahler. The young conductor’s instinct for getting to the heart of each scene provides this performance with prodigious cumulative momentum, and Nézet-Séguin is among the few conductors to have presided over a recording of Le nozze di Figaro who never loses his way in the opera’s magnificent ensembles. Tempi are quick: Otto Klemperer’s studio recording of a similarly inclusive edition of Nozze di Figaro runs sixteen minutes longer than this performance, but only in a handful of numbers do Nézet-Séguin’s speeds feel slightly rushed. Even in these instances, the impact of the music is strengthened by the effervescence of the conductor’s approach. For instance, Cherubino’s Act One aria ‘Non so più cosa son, cosa faccio’ is taken at such a clip that the singer can barely get the notes out. Get the notes out she does, though, and the rapidity of Nézet-Séguin’s tempo is justified by the dramatic efficacy that the aria gains from the breathless vivacity of the musical performance matching the ethos of the text. Nevertheless, the score’s lyric episodes, especially the Contessa’s ‘Porgi, amor’ and ‘Dove sono i bei momenti,’ are handled with sensitivity and pathos. At its most individual, Nézet-Séguin’s conducting of this Nozze di Figaro is never pedantic or precious: every motion of his baton is motivated by his personal response to Mozart’s score and dedicated to kindling a lucid, cogent performance that takes advantage of his cast’s considerable strengths. As unexpected as Nézet-Séguin’s mercurial tempi to ears accustomed to ponderous Mozart performances will be this recording's orchestral soundscape, which, contrary to recent trends in Mozart performances, is wholly without the slightest hint of a period instrument except for the aptly piquant sounds of Jory Vinikour’s fantastically witty but never obtrusive fortepiano continuo, practically an anonymous character in the opera who propels the drama without meddling in its resolution. Some listeners may never accept keyboard continuo extending beyond secco recitatives in Mozart’s operas, but in an era before the rise of podium-centric conducting in the modern sense can a composer and musician as ebullient as Mozart really be thought to have sat idly at the keyboard during arias and ensembles, awaiting the next stretch of secco recitative? Questions of historicity aside, Vinikour’s quicksilver but infallibly tasteful playing is one of the foremost delights of this Nozze di Figaro, one that the boundlessly inventive Mozart is certain to have appreciated. As in the previous DGG recordings of Die Entführung aus dem Serail, Don Giovanni, and Così fan tutte, Nézet-Séguin’s leadership spurs the Chamber Orchestra of Europe musicians to aspire to and succeed in matching the standards that Karl Böhm set with Staatskapelle Dresden in the 1970s. The orchestra’s instruments are modern, but the players who wield them have clearly absorbed many of the past half-century’s innovations in the field of period-appropriate practices. Like Böhm’s, Nézet-Séguin’s manner of preparing Le nozze di Figaro leaves traditions to conductors who prefer to borrow interpretations of Mozart’s music from others rather than devising their own. To this end, he and the COE musicians seek answers to questions about how to translate the notes into meaningful sounds in the score, trusting Mozart to have provided every clue needed to solve the opera’s riddles. Like their COE colleagues, the Vocalensemble Rastatt singers draw the animation of their performance from the music that Mozart entrusted to them, their singing of ‘Giovani liete, fiori spargete’ in Act One and the ladies’ dulcet ‘Ricevete, o padroncina’ in Act Three embodying the prevailing spirit of Nézet-Séguin’s leadership. The singers are thoroughly convincing as townspeople eager to enjoy a good party and perhaps a bit of intrigue without sounding as though they were recruited at a small-town barn dance. Performing Le nozze di Figaro is not unlike managing arrivals and departures at a busy airport. In this performance, both Chamber Orchestra of Europe’s instrumentalists and Vocalensemble Rastatt’s choristers touch down smoothly, the air traffic control of Nézet-Séguin’s conducting steering them clear of every peril. The junior member of a superlative ensemble cast, Swiss soprano Regula Mühlemann portrays Barbarina with a voice and a persona as fresh as newly-fallen autumn snow on the Matterhorn. In the vivacious girl’s Act Three scenes with the residents of Castello d’Almaviva and Cherubino, Mühlemann’s singing is perfectly-proportioned, and she voices the melancholic Act Four cavatina ‘L’ho perduta, me meschina!’ hypnotically. If she continues on this path, one followed in recent memory by Dames Margaret Price and Kiri Te Kanawa, there are surely memorable depictions of Susanna and/or the Contessa ahead of her. As the grumbling gardener Antonio, Susanna’s uncle, Canadian bass-baritone Philippe Sly is nothing short of ideal, the voice firm, attractive, and flexible and the quick vibrato intensifying the dramatic bite of the character’s frustrated sputtering. The brevity of the rôle is the only deficiency: Mozart would undoubtedly have composed an aria for Sly’s Antonio. In the Act Three scene in which Marcellina’s hastily-produced marriage contract with Figaro is negated by the revelation that the clever fellow is none other than her conveniently mislaid son, French tenor Jean-Paul Fouchécourt is a frenetically fussy Don Curzio whose pompous pontificating on the legitimacy of Marcellina’s contractual claim on Figaro is wonderfully over the top. Encountering an artist of Villazón’s stature in a small rôle like Basilio is unexpected, but how special the results of this experiment prove to be! Most importantly, Villazón does not over-sing: his every note falls readily into its appointed space in the drama. He sings lightly, the words on the breath, in the Act One trio with Susanna and the Conte, and his aria in Act Three, ‘In quegli anni in cui val poco,’ is drolly but handsomely sung, the tenor’s ebullient personality sparkling in the aria’s tempo de menuetto section. He, Fouchécourt, and Sly might profit lavishly from moonlighting as an operatic comedy troupe. As the male partner in the reluctant couple whose machinations, exploited by their aristocratic patron, feed the maelstrom that affects the drama’s course, bass-baritone Maurizio Muraro portrays Bartolo as a pompous conniver who only half believes his own orations. His razor-sharp diction compensates for occasional tonal unsteadiness, his verve in recitatives and ensembles supported by consummate musicality. Muraro sings the Act One aria ‘La vendetta, oh, la vendetta’ wonderfully: this Bartolo clearly remembers the lesson that he was taught by Basilio’s ‘La calunnia è un venticello’ in Il barbiere di Siviglia! The effects of an extensive career encompassing an uncommonly broad repertory on the voice of Swedish mezzo-soprano Anne Sofie von Otter cannot be ignored, but she gamely uses this to her advantage in her portrayal of Marcellina, Bartolo’s partner in crime and, as it turns out, more intimate activities. Sounding as proud as an affronted queen in her Act One scene with Susanna, von Otter sings her half of the duettino ‘Via, resti servita’ divertingly, savoring every mean-spirited syllable. Marcellina’s lines in the ActTwo finale are effortlessly dispatched, and von Otter wields her natural flair for unexaggerated comedy in the Act Three scene in which it is discovered that, rather than his contract-quoting betrothed, she is in fact Figaro’s mother, a development by which no one seems more shocked than she. Marcellina’s aria in Act Four, ‘Il capro e la capretta,’ is often excluded from both staged performances and recordings of the opera, but von Otter here sings it captivatingly, rolling through its divisions with the virtuosity that made her a force with which to reckon in Händel repertory. In the recorded history of Le nozze di Figaro, Marcellina has often been ignored, and in some of the instances in which she has been noticed it would have been preferable for her to have remained ignored. Von Otter cannot be ignored, and more’s the better: no Marcellina on disc has made the character’s rapid-fire transformation of a lover’s affection into a mother’s doting funnier. Singing the lovesick Cherubino with polished, pristine tone and tasteful ornamentation, American mezzo-soprano Angela Brower brings the rather foolish lad to life without either condescending to or overdoing efforts at conveying masculinity. Like Richard Strauss’s Octavian and Komponist, Mozart’s Cherubino was conceived as a soprano rôle, and Brower negotiates the tessitura with ease, maintaining an enchanting lightness even in moments of greatest dramatic duress. As mentioned previously, the tempo for the Act One aria ‘Non so più cosa son, cosa faccio’ pushes Brower, but she pushes back, the frenzied excitement of the music reflected in her libidinous-frat-boy vocal acting. The control that she exhibits in sustaining the bel canto line in Cherubino’s Act Two arietta ‘Voi che sapete che cosa è amor’ adds psychological depth to Brower’s characterization, suggesting that he is capable at least occasionally of reasoning from a perspective above his belt. Her vocalism in the duettino with Susanna, ‘Aprite, presto, aprite,’ glistens, and she radiates adolescent awkwardness when interacting with Barbarina. Cherubino’s young heart palpitates for the Contessa, but there are so many enticing ladies of all ages and stations at the Conte’s court: how is a boy to devote himself to only one of them? Perhaps the root of the Conte’s dislike of Cherubino is his recognition of a kindred spirit and competitor in an environment with room for only a single ravenous philanderer. Brower’s Cherubino is a pawn in everyone’s games, but how attractive she makes being used sound! In many performances of Le nozze di Figaro, the title character is little more than a grown-up but not altogether matured Cherubino, an amiable fellow who bumbles along with the mischief afoot in his master’s household. In this performance, the Figaro of bass-baritone Luca Pisaroni never misses an opportunity to make a play for the upper hand: the fact that he so seldom succeeds is indicative of the cunning of his adversaries. He and Susanna start Act One with a nimble performance of their first duettino, Pisaroni singing ‘Cinque... dieci... venti... trenta’ merrily, and the more sinister implications of the duettino ‘Se a caso madama la notte ti chiama’ are limned without vocal heaviness. Pisaroni’s delivery of the cavatina ‘Se vuol ballare, signor contino’ is good-natured, but the seriousness of his intention to tangle with the philandering Conte is unmistakable. He brings down the curtain on Act One with a voicing of the aria ‘Non più andrai, farfallone amoroso’ that brims with wry insinuation. Inventing the story of Figaro jumping from the Contessa’s window and upsetting Antonio’s prized flowerpot with quick-witted spontaneity, Pisaroni’s Figaro sails through the ActTwo finale by the seat of his trousers, even his best-crafted lies falling flat. Honesty may not be the best policy for his character, but the bass-baritone’s singing never fails him. In the Act Three scene with Marcellina, Bartolo, the Conte, and Don Curzio, Figaro finally finds himself at the top of the heap, the wily Conte flummoxed by the discovery of Figaro’s parentage, and Pisaroni’s voice booms with relieved pride. Nevertheless, uncertainty takes hold anew in the Act Three finale, and the shadows return in the singer’s vocal coloring. Figaro’s recitative and aria in Act Four, ‘Tutto è disposto... Oh Susanna, Susanna, quanta pena mi costi!’ and ‘Aprite un po’ quegli occhi,’ are sung as capably by Pisaroni as by the finest Figaros on disc, and he magnifies the importance of Figaro’s every word in the opera’s finale. From the gruff bottom to a ringing top F, Pisaroni has every note in Figaro’s range at the ready, and he portrays a dashing valet who serves sarcasm without sacrificing sterling singing. This recording documents American baritone Thomas Hampson’s third interpretation of Conte d’Almaviva for a major label. His intellectual comprehension of the Conte’s motivations, already well-honed at the time of his first recording of the part in 1990, has broadened in the years of his acquaintance with the music, but the voice as recorded in 2015 sounds astonishingly untouched by the intervening years. Ever a resourceful artist, Hampson’s Conte was from the start an ‘old soul’ portrayal, one in which an unquenchable carnal hunger does not wholly obscure an inalienable nobility. In this performance, his Conte blusters slightly more than in past, enhancing the notion that the Conte is a man of a certain age whose position is now a greater attraction than his person. In the Act One trio with Susanna and Basilio, ‘Cosa sento! Tosto andate,’ Hampson sings strongly, his timbre warming when he addresses Susanna. In the Act Two trio with the Contessa and Susanna and the act’s subsequent finale, though, the character’s mounting frustration and fury metamorphose the silvery tones of Act One into steel-edged weapons. The Act Three duettino with Susanna, ‘Crudel! Perchè finora farmi languir così,’ is distinguished by a momentary return to the gentle melancholy of Act One: can it be that the lusty Conte actually loves Susanna, at least on some level? Essentially thrown to the wind in many performances, the recitative ‘Hai già vinta la causa!’ and aria ‘Vedrò mentr’io sospiro’ are magnetically sung by Hampson, who then voices the Conte’s parts in the brilliant sextet and the Act Three finale with boundless charisma. After the hubbub of Act Four, Hampson takes the lead in bringing about the opera’s moving dénouement. Aided by Nézet-Séguin, who sets exactly the right tempo for the passage, Hampson voices ‘Contessa, perdono’ simply but poignantly, his tones centered and ideally weighted. 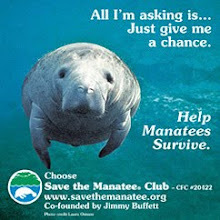 Hopelessly impenetrable would be the heart that did not react magnanimously to such a plea. An essential component of Mozart’s genius was his peerless ability to create morally-ambiguous characters who are alluring even when at their most repulsive. As sung by Hampson in this performance, the Conte’s words and actions are often reprehensible, but the man never is. It is silly when his first two commercial recordings of the Conte were so accomplished to suggest, as the colloquialism goes, that the third time is the charm, but there is no denying that Hampson remains a thoughtful, commanding Conte who charms. Bavarian soprano Christiane Karg provides this Nozze di Figaro with a Susanna who is at once both at the center of the drama and slightly removed from it. Intermittently sounding like a countess in training, this is a Susanna who follows her heart only after analyzing every situation with her formidable intellect. In her Act One scenes with Figaro, Karg is the personification of pre-wedding excitement, her rejoinders to her husband-to-be reverberating with joviality. Then, the socially savvy Susanna emerges in the scene with Marcellina, Karg’s singing in the duettino ‘Via, resti servita’ matching the overtones of von Otter’s lines with her own pointed aspersions. Sizing up her opponents in the trio with the Conte and Basilio, she is alternately coy and caustic, careful to maintain her integrity without figuratively biting the hand that feeds her. Karg’s account of the Act Two aria ‘Venite, inginocchiatevi’ shimmers with girlish jauntiness that only partially conceals more somber thoughts. In the terrific trio with the Conte and Contessa, the first of Susanna’s pair of top Cs disappears into the sonic hullabaloo, but the second appears, comet-like, above the ensemble. Karg complements Brower’s elan in the duettino with Cherubino, ‘Aprite, presto, aprite,’ the two of them conspiring like Hänsel and Gretel on the brink of being caught by their mother with berry-stained lips. Her vocalism in the Act Two finale gleams, and, like Hampson, she allows hints of genuine affection to surface in the Act Three duettino with the Conte. Karg leads the sextet with the determination of a musical Joan of Arc escorting her countrymen into battle, but the smiling mischief returns in the celebrated duettino with the Contessa and the madcap Act Three finale. Susanna’s recitative ‘Giunse alfin il momento’ and exquisite F-major aria ‘Deh vieni, non tardar, o gioia bella’ are the musical apogee of Act Four, and Karg delivers the former with communicative thrust and sings the latter with composure and expressivity. She seconds the Contessa beautifully in the opera’s finale. Karg’s Susanna is an especially suitable match for Pisaroni’s Figaro as she also has every note of her part in the voice. Many sopranos make the mistake of thinking that they must venture to give Susanna a palpable dramatic profile in order to establish her stature in the drama, but Mozart did that for them. Karg understands that what is required to realize Susanna’s full dramatic potential is to faithfully sing her music. This Karg does, often dazzlingly, and she thereby easily earns inclusion alongside Maria Cebotari, Bidù Sayão, Irmgard Seefried, Edith Mathis, and Lucia Popp among the superior Susannas on disc. Amidst the helter-skelter goings-on of this emotionally-charged Nozze di Figaro, the poised, imperturbable, sumptuously-voiced Contessa of Bulgarian soprano Sonya Yoncheva is profoundly touching and frequently surprising. The voluptuousness of her timbre prompts recollection of the fact that the Contessa is a rôle sung with merit in previous generations by Elisabeth Rethberg, Marcella Pobbe, and Renata Tebaldi, conscientious, capable Mozarteans whose voices were of markedly grander proportions than those of most of the singers now favored for Mozart performances. Yoncheva’s is not by any measure an enormous voice, but it is an instrument quite unlike the ‘blonde’ voices most often heard in the rôle. The Contessa’s E♭-major cavatina that begins Act Two, ‘Porgi, amor, qualche ristoro,’ situated without so much as one line of prefacing recitative, is one of the most treacherous entrances in opera, the long melodic lines unforgivingly exposed. Yoncheva needs nowhere to hide, singing the piece rapturously but with restraint and moving seamlessly through the full range of the music. In the trio with Susanna and the Conte that follows, ‘Susanna, or via, sortite,’ the soprano’s distinctive timbre makes her utterances stand out, and her voice is never lost in the boisterous ensembles that end Acts Two and Three. Yoncheva sings the recitative ‘E Susanna non vien!’ in Act Three with an immediacy that evinces the ironic anguish of a Contessa, once so eager to reinvent herself, who longs to again be uncomplicated Rosina. The C-major aria ‘Dove sono i bei momenti’ is one of Mozart’s most sublime inspirations, an interlude like Ottavia’s ‘Addio Roma, addio patria, amici addio’ in Monteverdi’s L’incoronazione di Poppea and Almirena’s ‘Lascia ch’io pianga’ in Händel’s Rinaldo in which time stands still as undiluted emotions gush from the music. Yoncheva’s performance of the aria is magical, her chocolate-hued voice flowing through the music like lava. Her lines in the duettino with Susanna, ‘Che soave zeffiretto,’ are sung with an incandescence in which music and words are virtually indistinguishable. Responding to the Conte’s entreaty for absolution in the Act Four finale, Yoncheva’s Contessa grants his request with a thread of tone that expands into a deluge of emotion in ‘Più dolce io sono, e dico di sì.’ Rather than trying to adhere to other singers’ conceptions of the Contessa, Yoncheva makes the rôle her own, coming to Nozze di Figaro with experience in parts including Monteverdi’s Poppea, Gounod’s Juliette, and Verdi’s Desdemona but without external sources’ misleading theories about how she ought to sound. In truth, the only indications of how a rôle should be sung by which a singer should be guided, whether singing the rôle for the first or the fiftieth time, whether on stage or in studio, are those provided by the composer. In the performance on these discs, it is apparent that Yoncheva learned the Contessa’s music under Mozart’s tutelage as bequeathed to posterity in his score. With such a teacher, how could she do anything but sing as personally and gorgeously as she does here? More than two-and-a-half centuries after its première, Le nozze di Figaro remains one of the most popular operas in the international repertory. Especially in the past fifty years, the score has proved immune to almost every conceivable directorial abuse. The music has survived poor singing, egotistical conducting, and wrongheaded efforts at adjusting the parameters of ‘stylish’ performance standards and increasing the opera’s ‘relevance’ for modern audiences. Regardless of these obstacles, the adage that asserts that the proof is in the pudding is as applicable in the opera house as in the kitchen. Why, then, does Le nozze di Figaro still challenge, amuse, and move? There is ample proof ripe for the hearing in this recording, which in terms of singing, conducting, and unwavering fidelity to the composer’s genius is a concoction fit for the most gluttonous Mozart appetites. When delays spawned by the ill-timed start of the Franco-Prussian War were circumvented and Giuseppe Verdi’s Aida finally received its première at Cairo’s Khedivial Opera House on 24 December 1871, it was apparent that Italy had at last produced a grand opera to challenge the epic-scaled French scores of Giacomo Meyerbeer and Fromenthal Halévy. Combining extraordinarily demanding rôles for each of the common Fächer and tremendous choral tableaux with episodic dances and grandiose scenic effects, Aida gave the Italian repertory a wholly worthy companion to Meyerbeer’s Les Huguenots and Robert le diable and Halévy’s La Juive. Aida is indisputably grand opera at its grandest, but it is also representative of Verdi at his most Verdian: amidst the opera’s spectacular tumult, emerging from the reeds along the banks of the Nile and the spoils of conquest there is the acute intimacy of human relationships. Though Aida is, like Les Huguenots, populated by exalted personages, the interactions among Aida, Amneris, Radamès, and Amonasro are the tribulations of ordinary people in extremis, not merely political collisions among states. Not even the greatest artist can fully transform Meyerbeer’s Marguerite de Valois from an archetype into a woman like any other, but the soprano who heeds the dictates of Verdi’s score can hardly fail to sense and project the humanity that makes Aida one of opera’s most persuasive protagonists. There is no question that this new DECCA Aida owes its existence to its Radamès, but the recording, benefiting from Maggio Musicale Fiorentino’s decades-long familiarity with the music of Verdi, offers a genuine ensemble in the principal rôles, making this an Aida not of impersonal exclamations but of earnest conversations. Especially with today’s paucity of Verdi voices, a perfect Aida is as elusive as an ideal Così fan tutte or Parsifal, but even this Aida’s imperfections often make valid points about the music and the characters who sing it. As suggested, the playing and singing of the Coro ed Orchestra del Maggio Musicale Fiorentino are the solid foundations upon which this Aida rises. The choristers’ singing is unfailingly energetic, too much so in a few passages of ragged ensemble, and mostly effective regardless of occasionally sounding artificially recessed. Problems of balance often intrude into the sonic landscapes of this recording, with singers often sounding as though they were recorded in separate acoustics. In the trio for Aida, Amneris, and Radamès in Act One, for instance, each voice seems to occupy a different sonic space, lessening the impact of this first confrontation between the two women whose actions instigate the opera’s tragedy. Still, the choral singers acquit themselves admirably, and their work is supplemented by the orchestra’s vibrant playing. Here, too, there are sporadic misadventures, accentuated by the recorded ambiance. In particular, there are strange sounds from the percussion, one of the most perplexing of which is an unnecessarily cacophonous clang at the end of the Act Four scene for Amneris and Radamès. The oboe and clarinet phrases in ‘O patria mia’ are lovingly rendered, and the wind playing is exemplary throughout the performance. The strings are thoroughly professional without being uniformly exceptional, their parts executed with easy proficiency that does not preclude a few instances of thinness on high, likely exacerbated by the recording. The choristers’ and instrumentalists’ efforts are marginally undermined, but the advantages of their acquaintance with Verdi’s music is never impeded. Mumbai-born maestro Zubin Mehta’s history with Verdi’s Aida is as extensive as any relationship between conductor and score in opera today. It was on the podium for a 1965 performance of Aida featuring Gabriella Tucci, Franco Corelli, Rita Gorr, and Anselmo Colzani that Mehta débuted at the Metropolitan Opera, and his MET Aidas in the seven subsequent performances in the 1965 – 1966 Season over which he presided were Martina Arroyo and Leontyne Price. ​Mehta’s first studio recording of Aida, a product of the mid-1960s, had among its cast Birgit Nilsson as Aida and Corelli as Radamès. Perhaps the presence of these vocal titans accounts for some of the marked differences between that Aida and this DECCA recording. The bristling dramatic thrust of the earlier recording, lifting the performance out of the studio despite singing from Nilsson that is never entirely idiomatic, is notably missing from this new recording. Mehta’s tempi are not exclusively slow, but many pages of the score here sound lethargic. Whether a conductor has at his disposal singers like Giulietta Simionato and Mario del Monaco or more earthbound vocalists, when a scene like that for Amneris and Radamès in Act Four—one of the most thrilling, tautly-constructed scenes in opera—fails to take flight something is wrong. Mehta’s instincts in general and in this performance are too musical to permit absolute failure, but there are enough shortcomings here to question the preparation that preceded the making of this recording. 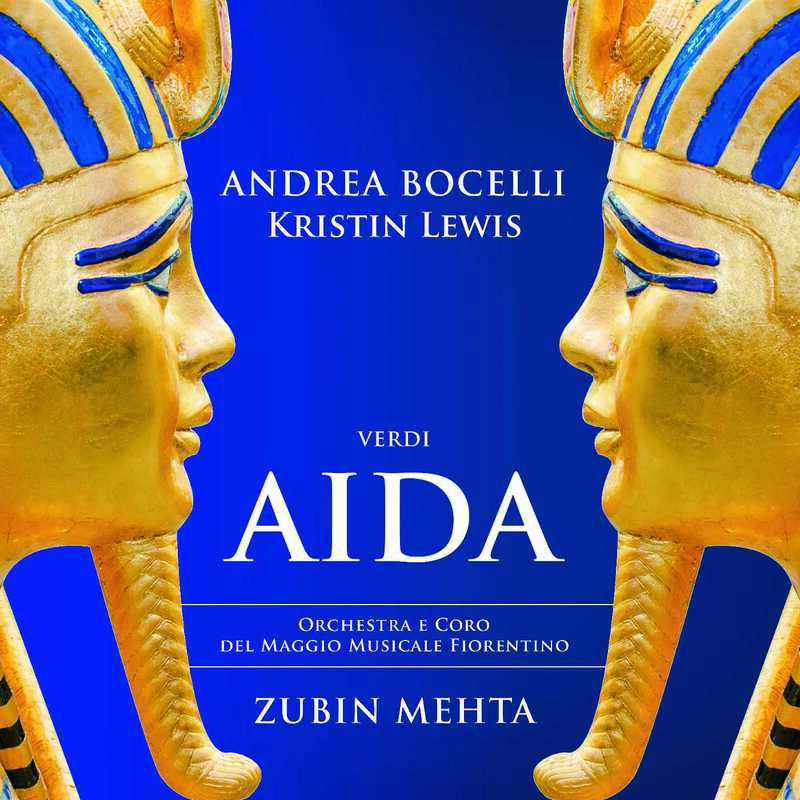 Comparing this Aida to Mehta’s HMV studio recording and broadcasts of other performances of the opera that he has conducted, it is difficult to believe that, as is stated in the liner notes, all of the musical forces were assembled in Florence under the conductor’s supervision for five days in April 2015. With a conductor of Mehta’s proven faculties in Verdi repertory at the helm, how can such a lifeless Aida have issued from circumstances conducive—if they were as they are asserted to have been—to fast-paced musical momentum? Aside from its American Aida, only the Messaggero and Sacerdotessa in this Aida are not native-born Italians, yet theirs is some of the best singing heard on these discs. Texas native tenor Juan José de León brings bright, focused tone to the Messaggero’s fateful news of the Ethiopians’ advance towards Egyptian territory. Bel canto repertory is his usual habitat, but the verbal acuity that serves him so well in Donizetti rôles is no less valuable in Verdi’s music. Mexican-born soprano Maria Katzarava, the unforgettable Leonore in Opera Carolina’s 2015 production of Beethoven’s Fidelio [reviewed here], voices the Sacerdotessa’s exotically melodic ‘Possente, possente Fthà’ marvelously, the garnet timbre of her voice and her unaffected diction striking precisely the right chord of reverent mystery. Her muted repetition of ‘Immenso, immenso Fthà’ in the opera’s final scene is equally ethereal. How many singers who have recorded the priestess’s music can assuredly be said to equal Katzarava as a Sacerdotessa eminently qualified to sing Aida? So prevalent has dry, wobbly singing of Aida’s bass rôles become that it might be supposed that Verdi’s score explicitly requests desiccated, unsteady vocalism. This Aida reaps the rewards of the participation of two basses who defy the trend by singing strongly and solidly. It was during an ill-fated 2010 performance of Don Carlos that Giorgio Giuseppini débuted at the Metropolitan Opera as another of Verdi’s troubled kings, Filippo II, substituting for an indisposed Ferruccio Furlanetto. A well-travelled Ramfis, Giuseppini sings il re d’Egitto in this performance, making his best stab at igniting a dramatic conflagration with a flinty account of ‘Su! del Nilo al sacro lido.’ Giuseppini’s vocalism is not opulent like Italo Tajo’s and Plinio Clabassi’s, but it is fantastic to encounter a Pharaoh who does not sound as old and weather-worn as the pyramids at Giza. Carlo Colombara is a veteran Ramfis whose experience lends his portrayal of the implacable character a slashing histrionic edge. Beginning with his firm articulation of ‘Sì: corre voce che l’Etiope ardisca’ in the opera’s first scene, Colombara establishes Ramfis’s significance in the drama. He declaims ‘Gloria ai Numi! Ognun rammenti ch’essi reggono gli eventi’ with authority, and his singing of ‘Ascolta, o Re: tu pure, giovine eroe, saggio consiglio, ascolta’ exudes ruthlessness. In both the scene with Amneris at the start of Act Three and the Judgment Scene in Act Four, Colombara’s Ramfis is a towering presence, a man who delights in his ability to subjugate even the mightiest in his society with his dispensation of unanswerable moral superiority. Colombara’s performance is not subtle, but neither is the character he depicts. Like Giuseppini, he impresses as much with what his singing lacks as with what it possesses. Aida’s father Amonasro is one of the most difficult of Verdi’s baritone rôles. Lacking the opportunities for character development through vocal display that Verdi granted most of his baritone leads, an Amonasro must toil diligently within the relatively brief span of his part to expose the psychological depth with which the composer and his librettist, Antonio Ghislanzoni, infused the captive Ethiopian king. Much is revealed about Amonasro by his first utterance in the opera, ‘Non mi tradir!’: reunited with his daughter after a separation of unknown duration, his first words to her are not a tender paternal greeting but an exhortation to maintain the secrecy of his true rank. In this Aida, baritone Ambrogio Maestri is a scrupulously musical Amonasro who works hard to eschew the unseemly barking and bellowing that are too often substituted for singing the part. Best known outside of his native Italy for comic rôles, Maestri also has extensive credentials in dramatic parts. In this performance, he follows an impactful statement of his opening ‘Non mi tradir!’ with a reading of ‘Suo padre... Anch’io pugnai... Vinti noi fummo e morte invan cercai’ that radiates thwarted sovereignty. In the pivotal Act Three scene with his daughter, a gentler facet of Maestri’s Amonasro is manifested in his voicing of ‘A te grave cagione mi adduce, Aida,’ but the stony-hearted monarch returns in ‘Non fia che tardi — in armi ora si desta il popol nostro — tutto pronto è già.’ Verdi’s directive con impeto selvaggio in the passage beginning with ‘Su, dunque! sorgete Egizie coorti, col fuoco struggete le nostre città’ is meticulously observed, and the vengeful glee of Amonasro’s interjection of ‘Di Nápata le gole! Ivi saranno i miei...’ after Aida cajoles the unwitting Radamès into betraying the Egyptians’ battle plan explodes from the baritone’s throat. Maestri consistently sings well, his command of the music’s tessitura exposing no deficiencies in the voice’s support. The baritone’s Amonasro ultimately is not as imposing as Warren’s, as frightening as Gobbi’s, or as inherently noble as Taddei’s, but his performance is assertive, bold, and legitimately Italianate. Most importantly, Maestri is the rare Amonasro who sings as well as he snarls—better, in fact. If Amonasro’s music frequently induces muscular shouting, Verdi’s music for the Egyptian warrior Radamès no less frequently receives from tenors one-dimensional wailing and whining. Though he studied with Corelli, one of the Twentieth Century’s most celebrated exponents of Radamès, the rôle is not a natural fit for Andrea Bocelli’s lyric instrument, but many tenors with vocal endowments more modest than the part’s spinto requirements have successfully sung Radamès. From the start of his stentorian recitative ‘Se quel guerriero io fossi! se il mio sogno si avverasse!’ in Act One, Bocelli’s crystalline Italian diction is splendid, and he is punctilious in refraining from forcing his voice in the famous aria ‘Celeste Aida.’ Following Corelli’s lead, he executes the arduous diminuendo on the aria’s climactic top B♭, likely profiting from discreet electronic assistance. In the aria and the scene with Amneris and Aida that follows, his voice rings out heroically, the close recording of periodically highlighting slight breathiness. In the grand public scenes in Acts One and Two, Bocelli sings Radamès’s lines in ensembles robustly. In his entrance in the passionate duet with Aida in Act Three, the tenor voices ‘Pur ti riveggo, mia dolce Aida’ with roiling ardor, and he phrases ‘Sovra una terra estrania teco fuggir dovrei!’ amorously. Like most tenors, Bocelli clearly relishes the exposed top As on ‘Sacerdote, io resto a te’ at the act’s end, hurling the notes out with abandon. In the incredible scene with Amneris in Act Four, Bocelli sings ‘Di mie discolpe i giudici mai non udran l’accento’ perceptively, his Radamès’s defiance of the arrogant princess stinging but not devoid of compassion. Facing his condemnation with resolve, this Radamès articulates ‘La fatal pietra sovra me si chiuse... Ecco la tomba mia’ with a stirring blend of courage and sorrow. His agitation as he realizes that Aida has concealed herself in the tomb with him is indicative of the enormity of his affection for her, and Bocelli and his Aida sing ‘O terra, addio; addio valle di pianti’ not as an elegy but as a paean to their liberating love. That Bocelli is a Radamès who would be overwhelmed by attempting to project the music into the vast spaces of the Arena di Verona, the Metropolitan Opera, or Teatro alla Scala is undeniable, but the seating capacity of the Khedivial Opera House in which Aida was first performed was approximately 850. In that setting, singing as he sings on this recording, he might have been unexpectedly convincing. There are moments of vocal discomfort in this performance, but Bocelli’s painstaking commitments to both music and text are irreproachable. Like Azucena in Il trovatore, Amneris is a rôle that demands almost superhuman reserves of vocal and dramatic stamina. Like Amonasro, she has no showpiece aria in which to refine her persona, but her music is the kaleidoscopic raw material from which the picturesque mosaic of Aida is assembled. Assuming her place in the lineage of Bruna Castagna, Ebe Stignani, Giulietta Simionato, Fedora Barbieri, and Fiorenza Cossotto, Roman mezzo-soprano Veronica Simeoni here depicts an emotional but curiously subdued Amneris whose edge of ferocity is blunted by the singer’s cautious avoidance of chest register. The cumulative potency of Simeoni’s singing in the Act One scene with Radamès and Aida, launched promisingly with an aptly haughty reading of ‘Quale insolita fiamma nel tuo sguardo,’ is compromised by an account of ‘Trema, o rea schiava, ah! trema ch’io nel tuo cor discenda!’ with a disfiguring dearth of venom. Like Bocelli, the mezzo-soprano performs her lines in the large ensembles with finely-judged tone and excellent diction. In the puzzling scene with her slaves at the beginning of Act Two, Simeoni is the rare Amneris who makes something provocatively sensual of the sinuous statements of ‘Vieni, amor mio, mi inebria... Fammi beato il cor!’ Joined by her rival for Radamès’s love, this Amneris’s furious irony in ‘Fu la sorte dell’armi a’ tuoi funesta, povera Aida!’ is surprisingly innocuous, the singer’s tones just uneven enough to impair her histrionic intentions. Finding Radamès inadvertently colluding with Amonasro in Act Three, Simeoni’s cry of ‘Traditor!’ conveys the princess’s shock and despair. As she ponders at the start of Act Four how to rescue Radamès from the wrath of Ramfis and his coven of priests, this Amneris caresses the melodic line of ‘L’aborrita rivale a me sfuggia’ as though she is aware on some level that this is as near as she will come to holding the remorseful but unapologetic object of her desire in her arms. Endeavoring one last time to bend him to her will in ‘Già i Sacerdoti adunansi arbitri del tuo fato,’ Simeoni’s Amneris is vanquished by Radamès’ determination to unfalteringly face his sentence but not before detonating a pair of spot-on top B♭s. In the formidable Scena del Giudizio, Simeoni sings ‘Numi, pietà del mio straziato core’ athletically, and she ends the scene with a sonorous top A. The firepower of the music that came before notwithstanding, this Amneris is most moving in the hushed, guilt-ridden pleas for absolution in the opera’s final scene. Simeoni here clearly understands and reacts to Amneris’s emotions, and her singing pulses with sincerity. Simeoni’s voice has great potential, but in the performance on these discs she is not yet a fully-developed Amneris in the tradition of her Italian forebears. As her stage experience in the rôle grows, Amneris will likely come to more completely inhabit her voice and her heart. Documenting a portrayal with which she has conquered many of Europe’s most prestigious stages, including those of the Wiener Staatsoper, Milan’s Teatro alla Scala and the Arena di Verona, where staging Verdi’s Egyptian epic is as much a sport as an art, Arkansas-born, Vienna-based soprano Kristin Lewis is a conflicted, often beautifully-sung Aida who comes frustratingly close to unmitigated success in this mercilessly demanding rôle. The DECCA catalogue documents the Aidas of Renata Tebaldi, Leontyne Price, and the idiosyncratic but plausible Maria Chiara, in addition to excerpts featuring the Aida of Birgit Nilsson. Visually, Lewis is the equal of the most glamorous, fetchingly beautiful Aidas in the opera’s history, but in the context of this recording she is not yet a totally satisfying Aida. When first heard in Act One, her ‘Ohimè! di guerra fremere l’atroce grido io sento’ sounds as though the voice emanates from a different, less-flattering acoustic than that in which her colleagues’ voices are centered. Having weathered the indignities of the Egyptians’ raucous readying for battle, Lewis’s Aida begins ‘Ritorna vincitor!… E dal mio labbro uscì l’empia parola!’ with the bitter taste of her countrymen’s blood flooding her senses, barely capable of repeating the hated words calling for her enemies’ victory. With her entreaty of ‘Numi, pietà — del mio soffrir,’ the soprano’s vocal demeanor softens markedly, and the text pours out on a stream of golden tone. Throughout the performance, Lewis’s singing is most attractive when the voice is not under pressure, but Aida is not a rôle in which carefree moments prevail. 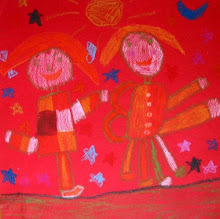 An illustrative example of what Lewis brings to the part is Aida’s Act Two scene with Amneris. Meeting her adversary in a duel of wits, Aida struggles to retain her grasp on whatever upper hand decorum affords her. Mindful of this, Lewis delivers ‘Ah! pietà!... che più mi resta? Un deserto è la mia vita’ with touching simplicity, saving her cunning for answering Amneris’s insinuations and veiled threats. Later, she handles the crests of the Scena trionfale with aplomb. Aida faces her greatest tests in Act Three, in which Verdi asks her to negotiate the very different vocal obstacles of a demanding aria—the aria by her performance of which many listeners unfairly assess an Aida—and duets with Amonasro and Radamès. Lewis uses the text of the recitative ‘Qui Radamès verrà... Che vorrà dirmi?’ as a springboard via which she rockets into ‘O patria mia.’ Her heartfelt, mezza voce performance of the aria, capped with a secure, superbly-sustained top C, grants the number the introspective core Verdi surely intended it to have. Aida’s amazement at her father’s intrusion into her reveries is meaningfully expressed, and Lewis then returns every volley lobbed at her by Maestri in the scene with Amonasro, furnishing some ecstatic top notes. The soprano’s efforts at spotlighting the contrasts between ‘Un giorno solo di si dolce incanto... Un’ora di tal gaudio... e poi morir!’ and ‘Padre, a costoro schiava io non sono’ yield spellbinding results. Deceiving Radamès at her father’s bidding, Lewis’s Aida is appalled by her own duplicity as she sings ‘Fuggiam gli ardori inospiti di queste lande ignude’ to her paramour. The terror of their discovery by Amneris and Ramfis shudders through the soprano’s enunciation of ‘La mia rivale!’ at the act’s end. Relieved of the necessity of battling for survival, Aida embraces the inner peace that has eluded her throughout the opera by pledging to meet death at Radamès’s side in the subterranean crypt to which Ramfis’s dogged justice dooms him. The sound of Lewis’s voicing of ‘Presago il core della tua condanna’ is that of a spirit on the precipice between life and death, the tortures of the former dissolving into the blessed oblivion of the latter. The delicacy of Lewis’s phrasing in ‘O terra, addio; addio valle di pianti’ offsets Bocelli’s tendency to blare above the stave, her sparkling top B♭s soaring above the gossamer orchestral textures. Like Wagner’s Senta and Isolde, this Aida seems more transfigured than overcome by death: it is a transition rather than a termination. Lewis is a young Aida, a relative novice—albeit already a practiced one—in a rôle in which some of the great singers of prior generations did not reach their primes until they were in their fifties. When Leontyne Price bade the Metropolitan Opera adieu with a performance of Aida in January 1985, five weeks before her fifty-eighth birthday, she remained capable of portraying Aida dazzlingly, musically and dramatically. With such an iron grasp on the part at this juncture in her career, Lewis has the skills necessary to blossom from this auspicious performance into the sort of Aida for which opera lovers long. It is unlikely that any other events—or, more properly, series of events—in human history affected Art as cataclysmically or as enduringly as the Second World War and the Holocaust perpetrated upon the people of Europe during the 1940s. Solely in music, the fiscal and cultural values of the manuscripts, archival materials, instruments, and properties claimed by the war’s destruction cannot be quantified; nor can the enormity of the impact of that destruction on global creativity, an effect that still persists despite the rapid pace at which the ranks of WWII veterans and survivors are dwindling, be overstated. It is impossible to know what Mozarts and Chopins, Verdis and Mahlers, Brittens and Coplands rest beneath the soils and waters of Europe, North Africa, and the Pacific, cut down by the artless monstrosity of inhumanity. Tragically, the disgustingly efficient killing machine of the Third Reich crushed within its cogs every member of the immediate family of Warsaw-born composer Mieczysław Weinberg, his parents and sister slaughtered at Trawniki after his flight to the Soviet Union. The anguish that he undoubtedly experienced in resolving to flee the land of his birth in 1939, without his family and mere weeks after graduating from conservatory, cannot have been far from his thoughts throughout his life. It is surprising to a degree that an artist’s soul could endure such damning realities, but Weinberg was part of the rightly-named ‘greatest generation,’ a global community of people who felt no less deeply than their counterparts at any time in human history but for whom survival was not a goal but a necessity. Weinberg’s quest for survival was a journey in music, and with this Challenge Classics recording of three of the composer’s most daring works violinist Linus Roth poignantly retraces an expanse of the artistic route that Weinberg followed from peril to peace. It was to his friendship with Dmitri Shostakovich, cultivated during his wartime residency in modern Uzbekistan, that Weinberg owed much of the stability that freed him to respond to artistic stimuli, but it was by Joseph Stalin’s death in 1953 rather than by Shostakovich’s influence that his life was spared and his official ‘rehabilitation’ secured. Nevertheless, his interaction with Shostakovich was a defining element of Weinberg’s career. 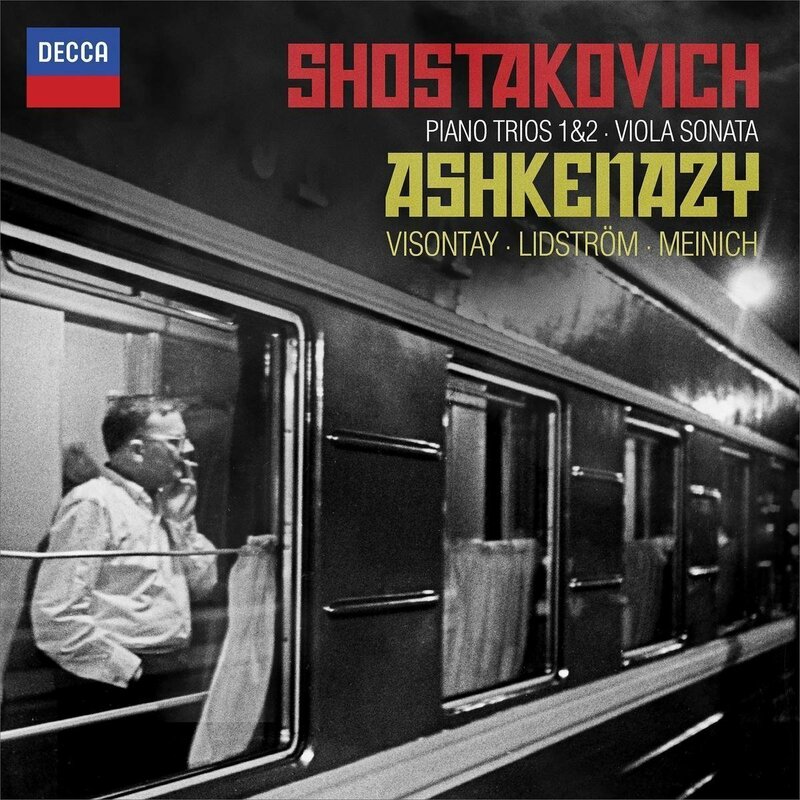 Written in 1922, when the Saint Petersburg-born composer was a student toying with forms and modes of musical expression, Shostakovich’s Three Fantastic Dances, played by Roth and Argentine pianist José Gallardo in the arrangement for violin and piano by Harry Glickman, are precisely what they purport to be— fantastic, vibrantly youthful pieces, employed on this disc as delicious digestifs amidst the heavier fare of Weinberg’s Solo Sonatas. The dances are not insubstantial footnotes to the chronology of Shostakovich’s compositional career, however. The playful atmosphere of the first of the two Allegretto dances is immediately established by Gallardo, who is as ideal a partner for Roth here as in their Challenge Classics recordings of Weinberg’s Sonatas for Violin and Piano. The recorded balance and timbral harmony between the piano and the 1703 ‘Dancla’ Stradivarius violin played by Roth are optimal in each of the three dances. In the second of the dances, Roth and Gallardo pace Shostakovich’s Andantino perfectly, their playing extracting every nuance from the deceptively one-dimensional music. The intuitive energy with which violinist and pianist perform the second Allegretto lends the Three Fantastic Dances a measure of the symmetry of a Baroque concerto. This is some of Shostakovich’s most approachable music, but approachability should not suggest simplicity. There are greater depths of emotion in the Three Fantastic Dances than many musicians bother to seek, and Roth and Gallardo probe deeply into these fetching pieces. The first of Weinberg’s Solo Violin Sonatas, his Opus 82, was composed in 1964, its genesis falling in the prolific period that also witnessed the completions of the Seventh and Eighth Symphonies and the Tenth String Quartet. Though generally not overtly programmatic in the manner of the music of a composer like Berlioz, Weinberg’s works frequently had as catalysts for their creation events of wide-ranging importance in his life. It is easy to ascribe to music for a single instrument characteristics of introversion and self-scrutiny, and it is impossible to overlook in the context of Weinberg’s Solo Sonatas the isolation that the composer must have felt in his adopted country, even with a wife and family and friends like Shostakovich. This numbing solitude, almost a self-imposed emotional exile, resonates in the first Sonata’s opening Adagio - Allegro - Adagio segment. There are never lacks of drama and drive in Roth’s playing, but from the start of each Sonata he is sensitive to the threads of lyricism woven into the scores. The subtle enchantment of the Andante movement flows mesmerizingly from Roth’s bow, and he excels in his handling of the rhythmic figurations of the Allegretto that follows. The contrasts of the Lento and closing Presto - Adagio sections are revealed not merely by clear differentiations of the tempi but also, more tellingly, by plying the innate power of the music’s light and shadows. It is virtually impossible to believe that the first of Weinberg’s Solo Sonatas is a product of the year in which popular music was dominated by the Beatles’ ‘Can’t Buy Me Love,’ the Animals’ ‘The House of the Rising Sun,’ and Manfred Mann’s ‘Do Wah Diddy Diddy,’ but Roth’s playing of each of the Sonatas is attentive to the music’s topical implications both within and beyond Weinberg’s oeuvre. Three years after the completion of the first Solo Sonata, Weinberg returned to the format in his Solo Violin Sonata No. 2 (Opus 95). The complexities of the first Sonata are intensified in the second, and Roth’s virtuosity is redoubled in his playing of it. The Monody that opens the Sonata receives from the violinist a display of extraordinary musicality, his gift for isolating moments of lyrical beauty amongst even the most strident sounds communicating the unexpected melodic intricacies of Weinberg’s music. The passions of the Andantino grazioso are fully explored without being exaggerated, and Roth’s playing of the Presto agitato combines youthful vitality with interpretive maturity. As in his performances of the inner movements of the first Sonata, the Andantino non tanto and Allegretto leggiero in the second Sonata are shaped by awareness of the temperamental atmospheres in addition to their tempi. The delicacy that Roth’s playing of the Lento affetuoso exudes gives way to the frantic, almost violent frisson of the Vivace marcato. There are many violinists whose techniques enable them to survive the demands of Weinberg’s second Solo Sonata, but this is music that must be understood, not merely controlled. The finest aspect of his performance of the Sonata on this disc is its prodigious aural evidence that Roth has not only acquired an unique comprehension of this score but has also developed true affection for it. The through-composed Solo Violin Sonata No. 3 (Opus 126) followed its older siblings into the world a dozen years after the completion of Sonata No. 2, and its unwieldy proportions, dementedly difficult writing, and bleak but chameleonic sound world make the third Sonata one of the most forbidding of Weinberg’s works and a piece that is virtually sui generis in the violin repertory. The expressive potency of his performance of the third Sonata reiterates that Roth is likewise a singular talent. Here, he makes sense of the volatility of the music’s abrupt changes of spirit, delving beneath the surface of the Sonata to uncover the spellbinding narrative that Weinberg hid in plain sight among the explosions of notes. As recounted by Roth, the Sonata’s tale has discernible protagonists and antagonists whose destinies are decided by the battles between melody and harmony. The misery and desolation of Weinberg’s youth formed the foundation upon which the Sonata was built, but Roth’s performance discloses the hope and humanity that give the music meaning just as they led Weinberg to a new life. For both violinists and listeners, even those with special appreciation for Twentieth-Century music, Mieczysław Weinberg’s Sonatas for solo violin are not easy going. This is music in which unspeakable atrocities are confronted unflinchingly, music in which one man sought answers to questions that ravage all of mankind. 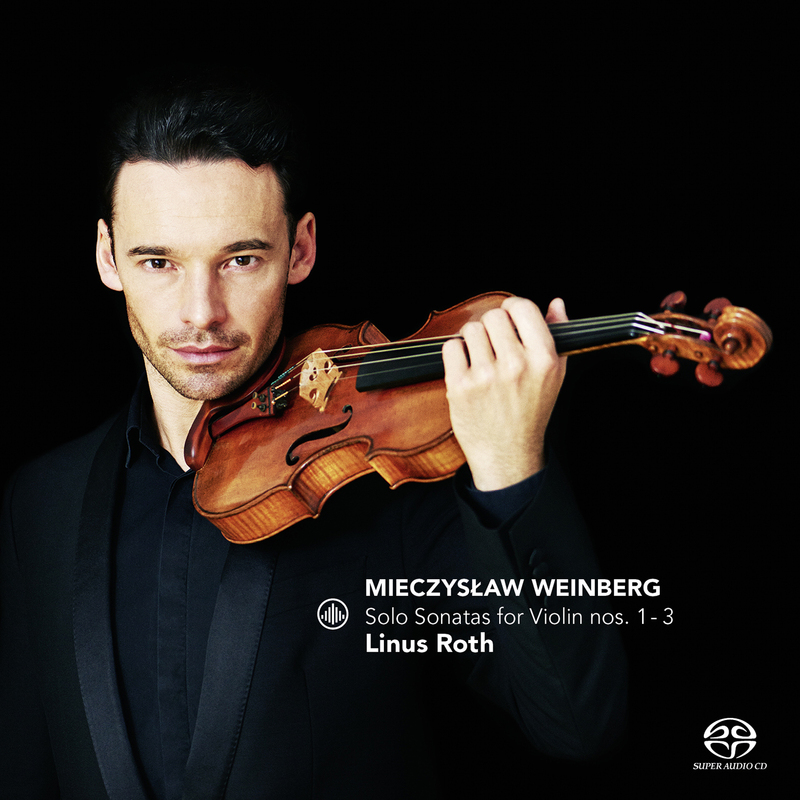 Perhaps these are questions with which each man must contend on his own, but few men can contend with Weinberg’s music as authoritatively as Linus Roth does in his performances of the three Sonatas for solo violin. This is not solely music making: what Roth achieves on this disc is the recreation of a solitary voice, now made intelligible to every pair of ears willing to listen. In an era in which humanity hides behind handles and ideas are expressed with hashtags, the intrinsic, enduring value of Art and the sacrifices that artists make in furthering it can seem dangerously undermined, even futile. The technological distractions of the Twenty-First Century were not so much as envisioned when Emily Dickinson wrote that ‘The Soul should always stand ajar / That if the Heaven inquire / He will not be obliged to wait / Or shy of troubling Her.’ Regarded as awkwardly introverted and misanthropic during her fifty-five years on earth, Dickinson’s long-suppressed and misguidedly-edited poetry have with every new technological advance revealed her to have been a stunningly intuitive prophetess of the modern age. In a musical career spanning more than six decades, Austrian conductor Nikolaus Harnoncourt demonstrated the prudence of Dickinson’s words. Throughout his career, in approaching the music of Ludwig van Beethoven Harnoncourt endeavored always both to open his own soul and to inspire the musicians with whom he worked to open their souls not only to the music itself but also to understanding its context and unexplored ways of performing it. Recorded during performances at the 2015 styriarte Festival that constituted Harnoncourt’s final appearance at the festival founded in 1985 to capitalize on the bond linking the conductor and his home city, this performance of Beethoven’s Missa solemnis is the culmination of nearly three decades of experience and a lifetime of intensive study and preparation. Remarkably, though, this performance sounds not studied but eruditely extemporaneous. Harnoncourt first conducted Beethoven’s colossal Missa solemnis in 1988, and he returned to the score infrequently but always with renewed dedication in the subsequent twenty-eight years of his life. The 2015 interview reprinted in the liner notes that accompany this Sony Classical recording highlights the very personal nature of Harnoncourt’s interaction with the score. There were instances in the conductor’s career in which his unique modus operandi yielded pedantry that deprived his performances of some pieces of qualities vital to their composers’ intentions. In the specific realm of Beethoven’s Missa solemnis, however, Harnoncourt was mindful of the fact that every aspect of a performance of the work cannot be controlled by a conductor, no matter how complete his mastery of the score. 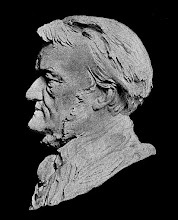 In this performance, Harnoncourt’s scrutiny of every tempo [as author Monika Mertl asserts in her liner notes for this recording, Beethoven requested as many different tempi in the eighty or so minutes of his Missa solemnis as Mozart included in the 180 minutes of any of his da Ponte operas], dynamic marking, and detail of orchestration produces a reading that surprises, enlightens, and moves, every eccentricity—and, in comparison with other recorded performances, there are undeniable eccentricities—drawing the listener nearer to Beethoven; nearer, perhaps, than any human ears have been since the composer’s death in 1827. Presiding over his Concentus Musicus Wien, the ensemble that he and his wife Alice founded in 1953, and the fifty-six voices of the Arnold Schoenberg Chor, Harnoncourt conducts a Missa solemnis notable not just for novelty but also for an abiding sense of emotional honesty that many performances of the score lack. Rarely on commercial recordings has the work’s significance as a musical point of intersection been more apparent. In the anguished cries for mercy in the opening Kyrie eleison, the churning first pages of Bach’s Matthäus-Passion echo through Beethoven’s music, and the monumental exultations of Händel’s Joshua and Judas Maccabaeus peal in the fugues of the Gloria and Credo. Mozart’s Große-Messe and Haydn’s Paukenmesse are present in Beethoven’s Sanctus and Agnus Dei, but so, too, are Mendelssohn’s Elijah, Brahms’s Ein Deutsches Requiem, the Masses of Anton Bruckner, Act Three of Wagner’s Parsifal, Elgar’s The Kingdom, Mahler’s Resurrection Symphony, and Britten’s War Requiem. Harnoncourt’s tempi, uniformly expansive [this performance runs for 81:34: representative performances conducted by the reliably unhurried Otto Klemperer (1965 EMI/Angel studio recording) and the mercurial Bruno Walter (1948 Carnegie Hall performance) have respective durations of 79:31 and 77:11], enable the musicians to neglect nothing and the listener to hear details of scoring obscured in almost all other recorded performances. In particular, the inventiveness and incredible difficulty of Beethoven’s writing for winds is poignantly revealed, and the expressive goals of the punishing, sometimes virtually instrumental use—abuse, some choristers might contend—of the chorus are stirringly realized. As shepherded by Harnoncourt in this performance, the awestruck, almost hesitant supplication of the Kyrie gives way to the guarded but resilient optimism of the Gloria. In his shaping of the Credo, Harnoncourt builds momentum in what is often the least-interesting portion of the Missa, the fleeting, a cappella ‘Et resurrexit’ emerging as bizarrely cathartic. Espousing the theory that the omission of an indication that the chorus should join in the fugue on ‘Pleni sunt coeli’ in the Sanctus was intentional, Harnoncourt here entrusts the passage to the soloists, who deliver it convincingly. Presumably played by Concentus Musicus Wien’s leader Erich Höbarth [this is not specified in the liner notes], the violin solo that meanders through the Benedictus and its exquisite Præludium at first seems disappointingly anemic, but it rapidly becomes clear that this is a well-considered component of Harnoncourt’s interpretation: in this mystical, mysterious Missa, the redeeming Holy Spirit is an elusive entity, an absolving force that must be sought, not merely invoked. The observance of Providential clemency in the Agnus Dei is here mournful, even remorseful, rather than celebratory, prefacing a Dona nobis pacem in which the longing for peace is shaped by weariness and desolation. Throughout the music’s dramatic shifts of mood, both the orchestra and the chorus rise fervently and with unflappable musicality to every climax. More than almost any other performance in the work’s discography, though, this is a Missa solemnis of introspection and contrition. The grandiose moments excite, but the moments of quiet contemplation transfix. Harnoncourt was tremendously fortunate in Graz to have in American soprano Laura Aikin, Argentine mezzo-soprano Bernarda Fink, Austrian tenor Johannes Chum, and Swiss-born bass-baritone Ruben Drole a quartet of soloists both willing to come to Missa solemnis with open minds and capable of fulfilling his and Beethoven’s demands. Chum launches the Kyrie handsomely, his slender tones projected with thrust sufficient to remain audible above the swells of orchestral sound. His phrasing is unfailingly elegant, and the suggestion of vulnerability in the voice makes his singing in the Benedictus, Agnus Dei, and Dona nobis pacem touchingly effective. Fink sings the alto lines superbly, her voice on wonderful form and her trademark nobility of utterance audible in every note that she sings. Aikin’s performance of the soprano part is so confident as to almost sound effortless, but this is not music that is conquered without toil. Nonetheless, Aikin possesses every necessary quality, providing a beacon of properly-weighted tone and perfect intonation for her colleagues in contrapuntal passages and rising without strain to a radiant top C in the Benedictus. In the exposed opening bars of the Agnus Dei, Drole’s lack of resonance in the bottom octave of the voice is more detrimental than elsewhere in the Missa, but he is an imaginative singer who draws strength from Harnoncourt’s vision of the mass’s final minutes as a desperate plea for concord rather than a jubilant paean to peace attained. It is with no malice towards singers, who are only human, after all, that it must be admitted that soloists are the principal drawbacks in many performances and recordings of Missa solemnis. Though only Aikin and Fink are genuinely outstanding individually, Harnoncourt’s styriarte soloists are an uncommonly successful consort whose singing impresses and gladdens in equal measures. Few works in the choral repertory ask as much of performers and listeners as Beethoven’s Missa solemnis. Like the skeptical Verdi and the agnostic Brahms, Beethoven engaged in a complicated, sometimes clumsy dance with faith, the steps of which he never fully perfected. Like Mozart, though, the unconventionality of his musical efforts in liturgical forms offer irrefutable evidence of utter sincerity. In the case of his Missa solemnis, the specific tenets of what Beethoven believed are not as important as the manner in which he internalized those beliefs; the ways, that is, in which his personal faith bridged the divide between divinity and humanity. In all niches of his broad repertory, Harnoncourt’s performances were rarely without idiosyncrasies. His conducting of Verdi’s Aida was downright strange, for instance, the undeniably fascinating final recorded product sounding more like ambitious Grétry than red-blooded, Italianate Verdi Grand Opera. That the lifeblood of the performance of Missa solemnis on this disc emphatically does not flow from the familiar ‘echt-Beethoven’ vein tapped by Bernstein, Böhm, and Karajan does not diminish the potency of its plasma. There is no shortage of ‘different’ readings of Missa solemnis, but the vast majority of these fail to meaningfully deepen the listener’s comprehension of this magnificent work. 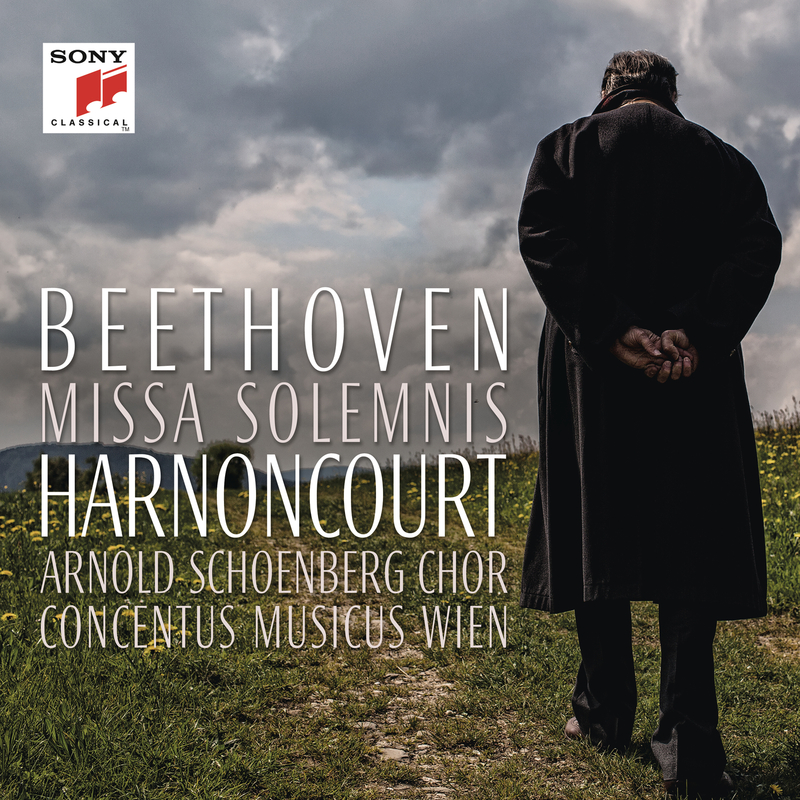 Nikolaus Harnoncourt was a musician of strong convictions, and this Missa solemnis, billowing with meaning, is an affecting validation of his Job-like artistic ideology: to question is to discover, and to discover is to empower even the least-perceptive listener to commune with genius.